Monika was great to work with and was quick to ensure that all of my needs and wants were met when it came to finding the perfect Kona for me. She was patient with my indecision between which models I wanted, and was able to get me into a Kona Ultimate demo vehicle at an affordable price. Her customer service is bar none and everyone at Hyundai of Muskoka makes you feel welcome and part of the “Hyundai family.” I had a very good experience with Hyundai of Muskoka and I would recommend anyone looking for a Hyundai to shop at this dealership first. Grace, Jeff and Jason of Muskoka Hyundai went to bat for me to get me into the vehicle I wanted and more. Grace, in particular, worked very hard on my behalf to secure the financing for me which was not a clear cut task due to a divorce in 2013 and the resulting financial issues from that. I absolutely love my vehicle and the light-hearted dialogue with the above 3 people. I am very much about the”vibe” you get with those that cross your path and my “ vibe” with these 3 people was a great experience. Would certainly recommend this dealership to my friends and have already done so and brought her to meet with Jeff, my sales man. We researched and test drove the Tucson at a different dealership and they did not make any effort to satisfy what we were looking for. I was referred to Hyundai of Muskoka by a friend and the sale of our Tucson was over the phone. Monika listened to what we were looking for and phoned back in a few hours with exactly what met our needs. Grace was amazing and presented all available options to us! Both of these ladies are amazing and were fabulous to deal with! As a female purchaser I enjoyed working with another female sales agent. Buying a vehicle can be intimidating as a woman sometimes but this experience was very positive. Thank you Monika. – Barbara B., March 27, 2018. I was so impressed with the sales staff. They listened to our needs and what was important to us. Very friendly, introduced themselves to us right away and shook our hands. We felt very relaxed and felt confident when it came to making our decision. We have been to a few dealerships and we rate Hyundai of Muskoka #1. Thank you Monika for the great experience we had buying our Tuscon…it was so nice to be introduced to all the staff from sales to the service department…Grace you were awesome with the best financing possible for us. What an awesome team. They are top notch people you have a top shelf team in MUSKOKA representing HYUNDAI from them all and a big shout out to JEFFEREY HOWIE and GRACE CAPELL a fantastic job WELL DONE EVERYONE!!!!!! – Reginald M., March 20, 2018. Dirk and Patrick are bar none THE best service coordinators I have ever dealt with. They call me by my name making my service appointments personal. I get continuous updates and they are honest and friendly while being incredibly professional. I will always bring my car to them they help me to maintain my Sante Fe while keeping my budget in mind. I adore those guys they are the only reason I bring my car there. I’m certain the mechanics are equally exceptional if they have half of the knowledge and kindness Dirk and Patrick do. – Paul and Glenna C.
“I cannot Thank you enough for your prompt, efficient and gracious assistance to Megan with this whole AC issue. This is the type of service that keeps people coming back. I can tell you that you have certainly renewed Megan’s faith in “The World”. She certainly recognizes that she made the correct decision in buying a Hyundai but more importantly in buying it from Hyundai of Muskoka and even more importantly from you. “Jason Armstrong, We’ve never met but I recently spent over $100,000 on 3 new vehicles from your dealerships. Two Hondas (Accord, Civic) and a Hyundai (Santa Fe).Two for work, one for personal use. The Hondas are being used by my driving school, Young Drivers of Huntsville. It is very important that new drivers have a pleasant and safe driving experience, as they already have enough things to think (and worry) about! 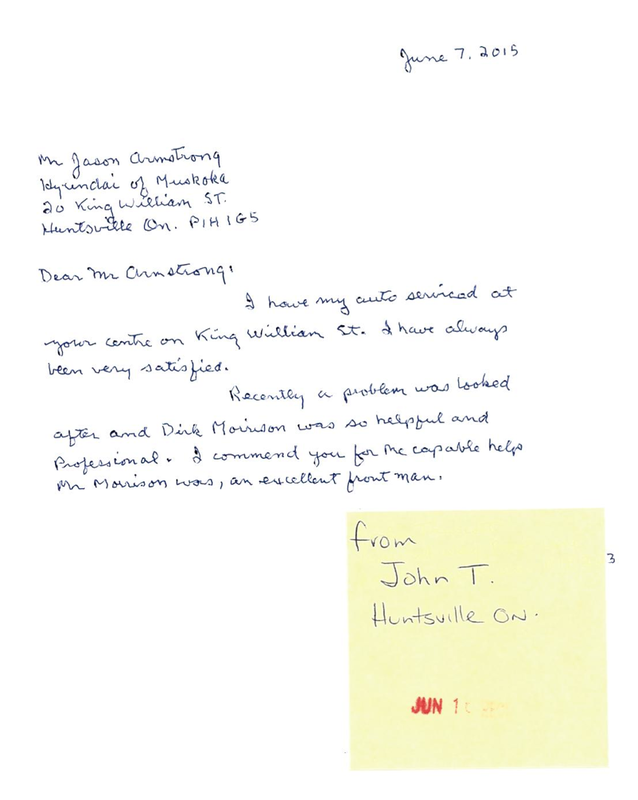 From the initial contact with Jay (Honda) and Matt (Hyundai) the professional and courteous manner was evident. Sean (Honda Sales) even came and did some presentations to our new drivers, at no charge. Since then, all our interactions have been outstanding. The service departments are right on the ball. Both Christina (Honda) and Dirk (Hyundai) are always pleasant, respectful and compassionate. Theirs is not an easy job! I always feel welcome at either dealership and the extras (internet, coffee) are really appreciated. When you work hard and consistently go above and beyond the call of duty, you should be thanked. I’d like you to pass along my appreciation to all those folks, and the ones I haven’t met yet.